Star making is not an exact science. But when you took a look at Nick Hein’s pre-UFC resume and through in the fact that he is a German fighter making his Octagon debut in Germany this Saturday on UFC FIGHT PASS against Drew Dober, it’s easy to see why people have been captivated by the Elsdorf native’s story. 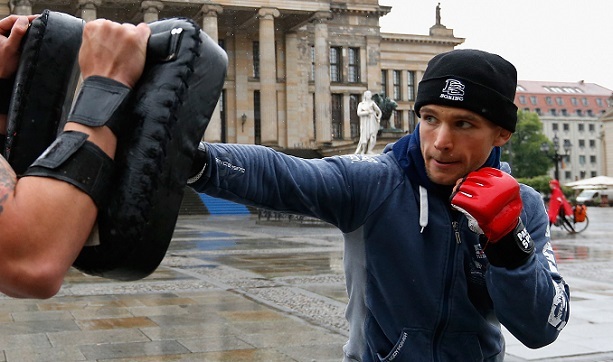 Not easy may be an understatement, as Hein has been the focal point of the promotion locally, but despite getting pulled in several different directions while still trying to keep his training and mental focus intact, he’s finally seeing the finish line in Berlin. With a 10-1, 1 NC record as a mixed martial artist, Hein has impressed in competition thus far and he is expected to continue his success in the UFC’s lightweight division. But going back to that star making thing, why has Hein captured the imagination of the public and the media like few recent debutants have? Well, he is a police officer, actor, and a top-level judoka who came close to earning an Olympic berth. Yeah, he’s not your average prizefighter. So how does he keep it all together? If the 30-year-old - who now makes his home in Cologne - sounds like he has a sense of urgency to succeed, realize that he considers the UFC not just the latest step in his MMA career, but his own personal Olympics after falling short of making the 2008 Games in Beijing. “Let me tell you something, it was heartbreaking,” said Hein. “Making the Olympics is the dream of any athlete competing in an Olympic sport. My career started very well with two national titles in judo as well as winning the European Under-23 Championship in 2006, but I had the misfortune of competing in the same weight class and at the same time as arguably Germany’s best judo player of all time – Ole Bischof. A pro since 2009, Hein has not lost since a September 2011 defeat to Sebastian Risch, with his most recent victory a unanimous decision win over Michael Erdinc in February. That’s a long time to stay unbeaten in this sport, but he whittles the reasons for his success down to two simple components. It was right on time, because he’ll need to be in peak form, not just for his Saturday bout against Dober, but for every UFC fight from here on out. Call that just another reason to be intrigued by Sergeant Hein, who says of his primary influence, “The biggest influence in my life is the Lord: He is my rock, my fortress and my savior.” He also admires German judoka Udo Quellmalz, but at the same time jokingly cites “Dirty” Harry Callahan and Judge Dredd as influences in his day job as a police officer. So when it comes to star making, Hein’s rapid rise is no surprise, as he’s got plenty of aspects of his life and personality to draw in all demographics. But when it comes down to it, Hein doesn’t care about being a star; he just wants to be a winner.